NOW IN STOCK! Order yours today (Click on photo for details). And be sure to check out our newest release, "Hyms Of The Old West" (featured below). 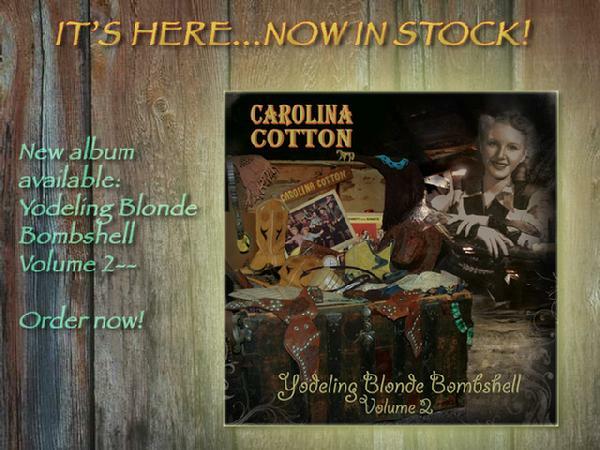 Welcome to the official site of Carolina Cotton, dedicated to the memory of America's favorite yodeling cowgirl from the Golden Age of Western Swing music and B movies. Come explore our Virtual Museum and experience Carolina's fascinating career, from her personal collection of memorabilia. 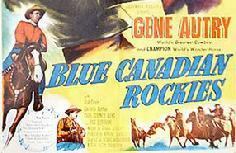 Journey back in time to the days of cowboy and cowgirl heroes, as they rode across the silver screen at the Saturday matinee. 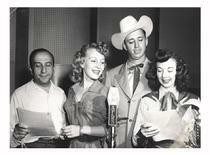 When the radio airwaves were alive with Western Swing music and variety shows. When Television was something new and curious. And folks enjoyed a fun-filled evening at the local Dance Halls and Grand Ballrooms, dancing the night away. From the early 1940s to the mid 1950s, Carolina Cotton was one of Hollywood's early innovators of Western entertainment. And, yes, she was a yodeler (and WHAT a yodeler!). THE NORTH "POLE" STORY: READ ALL ABOUT IT! story of her fascinating trip to Fairbanks, Alaska. give you a glimpse into how much fun they were (and still are). And if you were there, this will bring back some great memories. Festivals. Lots of photos, too! Only $25, including postage. book, "Terror, Tragedy and Tears in The Evergreen State". of time. 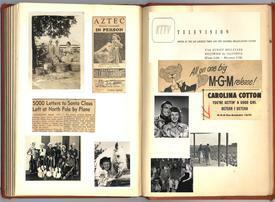 Rare photos, publicity material, and Carolina's script can be found on the site. that there is now an official website for the Park! Curtis Matthews, owner of the amusement center. and other Western celebrities frequently appeared. 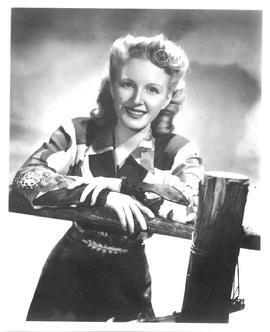 "Old Time Radio, Where Memories Live Forever"
Carolina Cotton's story is one of humble beginnings and leads on to her becoming one of the best-loved cowgirl entertainers of the era. Her amazing swing-style of yodeling, along with her lively "girl next door" personality, won her fans the world over. Carolina sang and toured with many great Western Swing bands, as well as recorded her own songs for King, MGM and others. 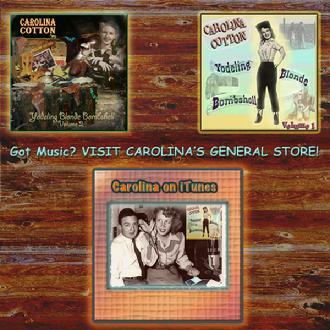 A Discography, and stories of the many Western Swing artists Carolina worked with, can be found on the MUSIC page. Miss Cotton made several B Western films...many of which showcased her yodeling skills. She also made Soundies--an early form of today's Music Video. 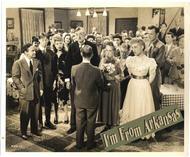 Wedding scene, "I'm From Arkansas", 1944. The Yodeling Blonde Bombshell guest starred on many radio and television shows in the 1940s-1950s. She was one of the first female disc jockeys in the country, as well as a pioneer in the early days of TV. Find out more on the RADIO / TV page. 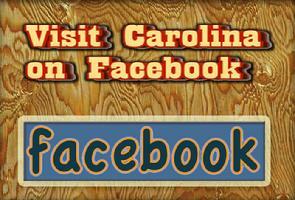 Carolina Cotton made countless personal appearances, not only in Southern California but nationwide. For photos and a list of just where and for what she appeared (a very diverse list! ), visit the APPEARANCES page. The Armed Forces were connected with Carolina throughout her entertainment career. She performed for soldiers in California, visited military bases within the US, and entertained abroad with the USO. 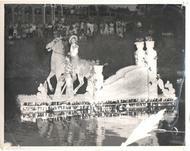 The story of Miss Cotton's history with the Armed Forces can be found on the MILITARY / USO page. One of Carolina's finest movies, this fully-restored 1952 Gene Autry classic features her performing "Loving Ducky Daddy" and "Yodel Yodel Yodel". Click on the poster (right) to order the DVD from the Autry Museum store. 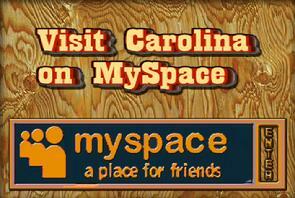 All materials on this site Copyright 2005-2012 CarolinaCotton.Org, B2 Productions. All rights reserved.